The python rescued in Pathsala. 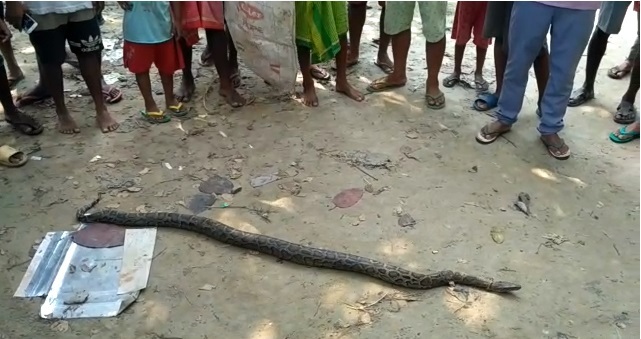 A seven-foot-long python was rescued in Lower Assam’s Pathsala on Saturday. The python which was trapped in a fishing net was rescued by local residents at Denartari village under Pathsala police station in Barpeta district. It is presumed that the snake trapped in the fishing net when it entered into the human habitation in search of food. Local residents handed over the rescued python to Pathsala police, which subsequently handed it over to the forest department, sources said. Forest department officials said the snake is under observation and will be released into its natural habitat soon. “During the monsoon, many reptiles struggle to find a safe habitat in the deforested cities. Growing habitat destruction has forced the wildlife to forage and seek shelter in the human habitats,” said a forest official. “Most snakes are burrowing reptiles and they spend most of their time underground, but during the monsoon their hiding places usually get flooded and they are forced to venture into human habitations,” he added.